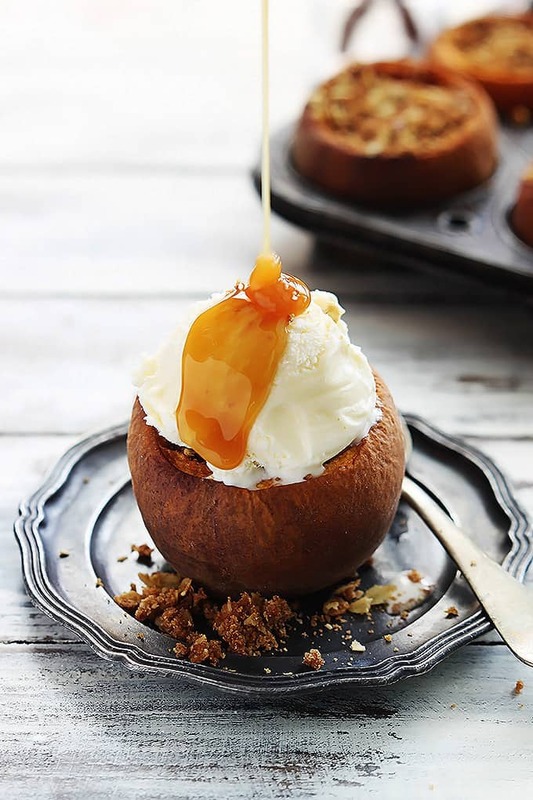 Juicy yellow peaches filled with peach crisp, baked, and topped with creamy vanilla ice cream and caramel sauce. I have eaten so much good food this week. Gahhhh, I’ve been in my own personal coastal eating paradise here. We’ve been in Southern California this whole week, visiting my grandparents, Disneyland-ing, eating, driving up the coast, eating, sight seeing, eating, and um… eating some more. This is honestly my personal heaven. I’ve had tacos… 5 times? And we’re talking about some of the best tacos I’ve ever had in my whole life – that’s saying a lot guys, tacos are my favorite food! And the fish. I’ve had 3 kinds of fish since we’ve been here too. I tell ya, this. is. the. life. I’ve stuffed my self over-the-top full this week but I keep telling myself it’s all part of the pre-Thanksgiving-prep. That’s the phase I’m in right now. You’ve gotta start early if you want enough room in your belly to fit allll of the Thanksgiving deliciousness you know is on its way. 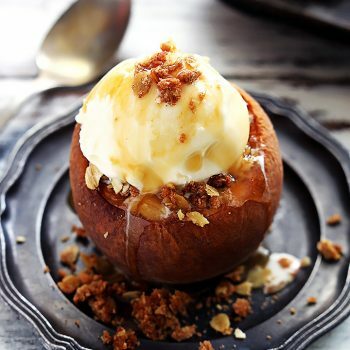 These peach crisp stuffed baked peaches would make the most amazing slam-bang finish to the perfect Thanksgiving meal. 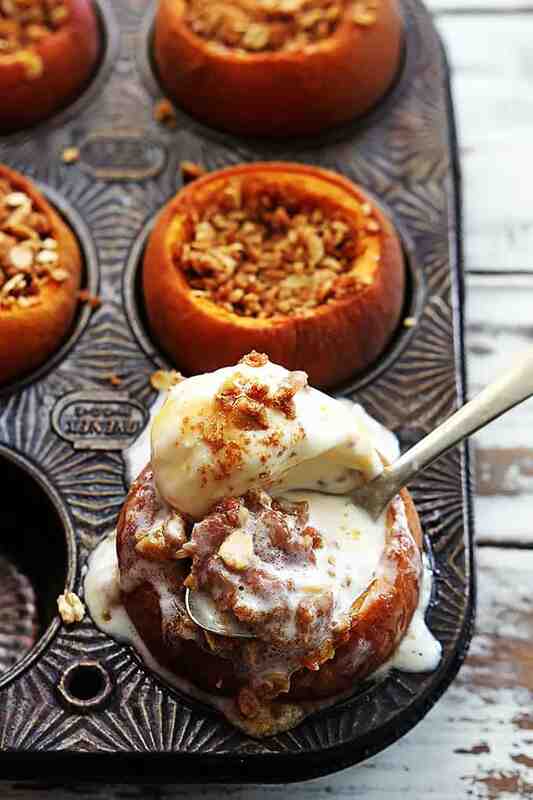 I’m not really a pumpkin pie person so these are definitely going on our menu. 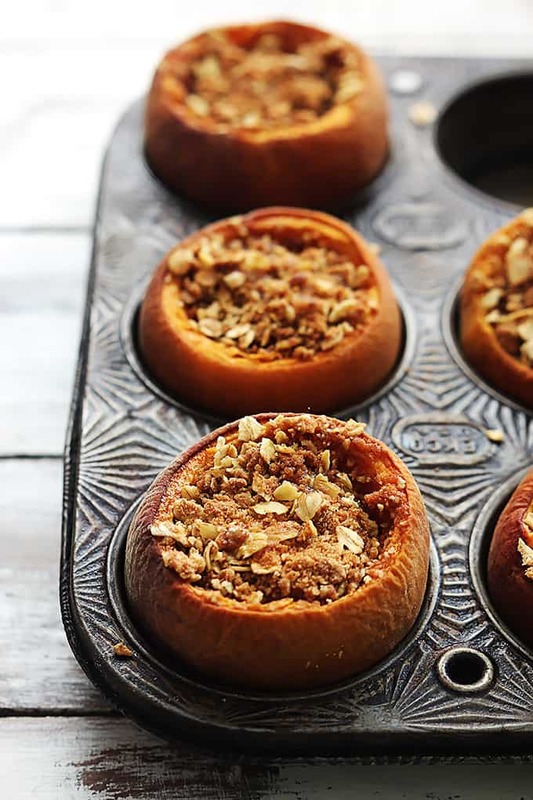 I love the juicy peaches topped with crispy crumbly cinnamon oat goodness. And whatever you do, do not forget the ice cream and caramel sauce! It’s the extra touch that really brings the whole dessert to life. I’m a sucker for warm-frozen desserts. 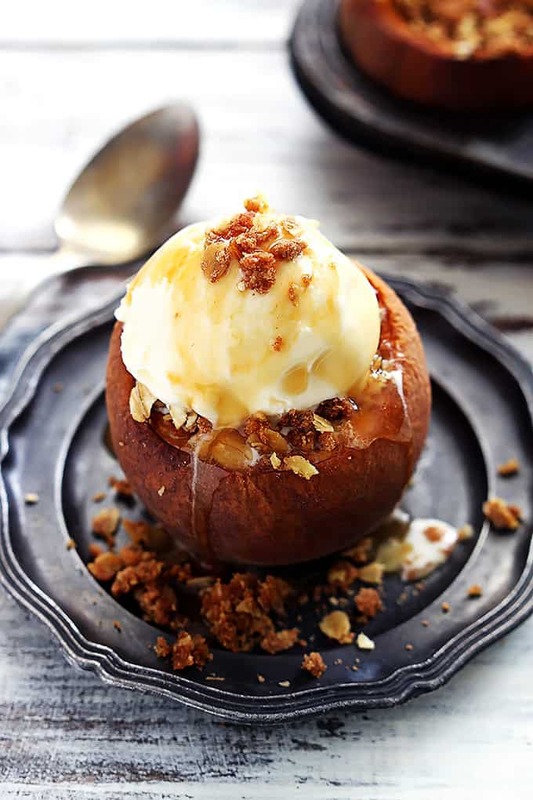 The combination of something soft and warm and melty with some cold and creamy ice cream just sends me over the edge into happy dessert land. These are even easier (and yummier!) than traditional crisp and done in 30 minutes or less so you have no excuse not to make them! Preheat oven to 400. Lightly grease a baking sheet or muffin pan (if peaches are small enough to fit into the muffin holes) and set aside. Next prepare the peaches and filling. Cut ¼ inch off of the top of 5 peaches. Remove and discard the pits (see note) and scoop out the remaining flesh so the peaches are hollowed out (leave about ¼ inch of the outermost flesh/skin intact so they don't fall apart. ) Dice the flesh (just cut into ½ inch pieces or so) and add to a medium sauce pan. For the remaining peaches, peel the peaches, then cut into wedges, then dice and add those pieces to the pan. Add butter, brown sugar, and cinnamon to the pan. Saute over medium heat about 5 minutes until peaches are very tender. Divide this mixture between each of the hollowed peaches. Top with the crumble mixture, then place on prepared baking sheet (or muffin tin) and bake for 12-15 minutes. Optional: sprinkle with coarse sea salt after removing from oven. Top with vanilla ice cream and caramel sauce if desired. Serve immediately. *For hollowing out the peaches, I found that using a sharp paring knife to cut right around the pit was the easiest way to remove the pit. Then I used a spoon to scoop out the rest of flesh. These summery peaches are so insanely refreshing to see amongst the sea of gravy and cranberry sauce recipes out there right now! Tasted great. A tad bit too much butter but an excellent recipe. !